Bristol and Bath Rising Tide Stopped Coal Train! 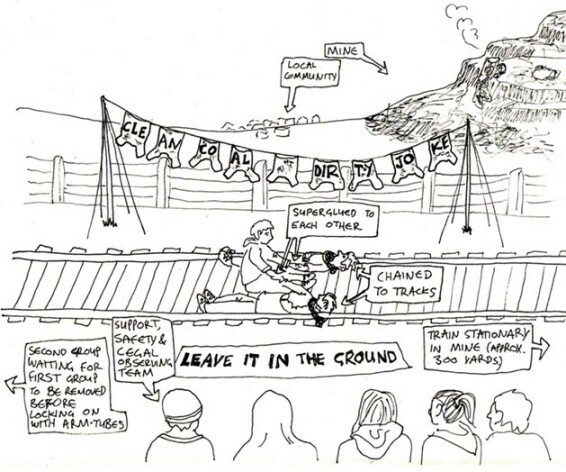 On Monday 26th April, people involved in the Rising Tide Network have literally puts their necks on the line by chaining themselves to the rails in order to block the rail link to the Ffoss y Fran Open Cast Coal mine near Merthyr Tydfil. They are currently blocking the movement of coal trains from the mine to Aberthaw Power Station. It took the combined efforts of British Rail Police and South Wales Police over 8 hours to remove the last of the protesters at 8.10pm on Monday evening. 18 People from Bristol and Bath have been charged under the Malicious Damages Act of 1861, a law to protect the interests of 19th Century rail owners. If convicted they face anything up to a life sentence in prison. The 18 People, who are part of the Rising Tide (UK) Network were held for over 24 hours, and were only allowed to phone out after 11.00 am yesterday (Tuesday). The house of one of those involved was raided by 8 police officers who spent 3 hours searching their home. â€œWe are protesting against the continued extraction and burning of fossil fuels in the face of a global climate emergency. The failure of the Copenhagen climate talks to deal with this huge problem, and the obvious policy inadequacy the three main UK parties contesting the general election to take the necessary action to tackle the problem has highlighted the need for the people to take grass-roots direct action. The protesters claim that the process by which Miller-Argent were able to get the go ahead to exploit this resource was at a high social cost of both the local and global community. They also claim that the process highlights the democratic deficit in the planning process, which takes in to consideration the social-environmental impact of such projects. The UK government developed â€œThe Planning Commissionâ€ to be “independent body that decides applications for nationally significant infrastructure projects”. The protesters assert that it will only make these things worse, being able to ignore any consideration in favour of profit. on 10th May at 10.00 am.